First described by Schultz in 1729, the condition of heterotopic pancreas is an infrequently occurring anomaly 1. Although typically asymptomatic, this condition can present as a submucosal heterotopic mass or as symptoms of chronic pancreatitis and abdominal pain. Currently, resection is indicated when symptoms are persistent and underlying malignant process cannot be ruled out 2. Here we describe the surgical management of heterotopic pancreas in a 48 year-old man. A 48- year- old man with a past medical history significant for alcohol abuse, anemia, and chronic abdominal pain, presented to our institution with worsening abdominal symptoms. Laboratory studies showed a mildly elevated lipase and a CT scan demonstrated pancreatitis with a mass-like lesion in the stomach (Figure 1). An EGD was performed which confirmed the presence of a submucosal mass (Figure 2). Subsequent mucosal biopsies were unremarkable. Given the inability to rule out an underlying neoplasm, the patient underwent a partial gastrectomy with Billroth I reconstruction. At one month post operation, the patient was doing well and was not experiencing significant pain. A segment of the stomach and attached perigastric adipose tissue was obtained intraoperatively for pathology evaluation. The stomach fragment contained a polyploid mass measuring 3cm in diameter, which was gray-white in color and had a soft texture. A frozen section of this sample revealed heterotopic rests and mucosal hyperplasia. Final pathology demonstrated polyploid pancreatic heterotopia with acute and chronic inflammation and abscess formation (Figure 3). Fortunately, no evidence of malignancy was present. Heterotopic pancreatic tissue is frequently found throughout the upper gastrointestinal tract with a propensity to be located within the stomach, duodenum and jejunum 3. 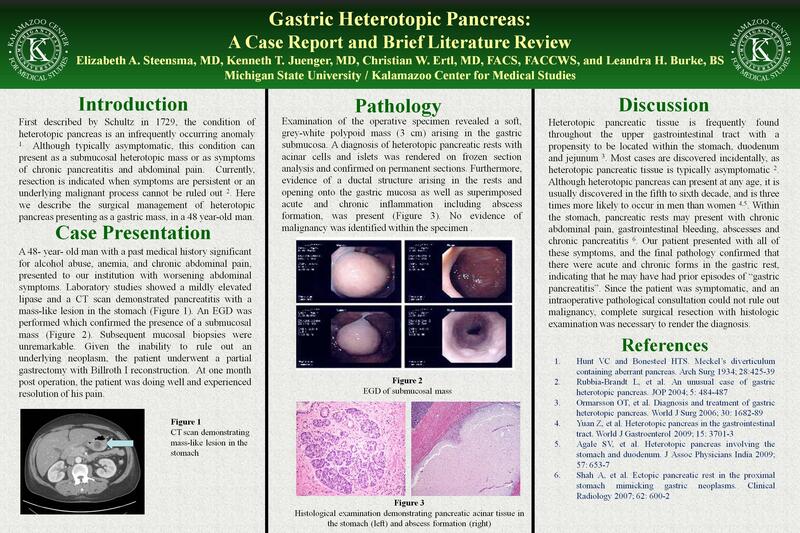 Most cases are discovered incidentally, as heterotopic pancreatic tissue is typically asymptomatic 2. Although heterotopic pancreas can present at any age, it is usually discovered in the fifth to sixth decade, and is three times more likely to occur in men than women 4,5. Within the stomach, pancreatic rests may present with chronic abdominal pain, gastrointestinal bleeding, abscesses and chronic pancreatitis 6. Our patient presented with all of these symptoms, and the final pathology confirmed that there were acute and chronic forms in the gastric rest, indicating that he may have had prior episodes of “gastric pancreatitis”. Since the patient was symptomatic, and an intraoperative pathological consultation could not rule out malignancy, the patient elected to undergo surgery to remove the polyp.